Akai's Max49 looks to the past as well as the future. 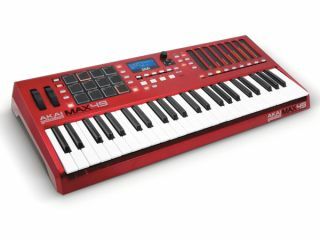 NAMM 2012: In a world of oh-so-similar MIDI controller keyboards, Akai's new 49-note Max49 stands out for several reasons. To begin with, it gives you CV and Gate outputs that enable you to use it to control analogue synths, and there are also eight backlit LED touch faders. These sit alongside 12 backlit MPC pads, a built-in step sequencer and an arpeggiator with latch and time division controls. That's certainly enough to get us interested, and there's also the AkaiConnect software, which automatically maps the controls to VST plug-ins, to consider. Oh, and we like the colour, too: you can't go wrong with a red keyboard. Specs below and a preview video above - we'll have more on this one soon.